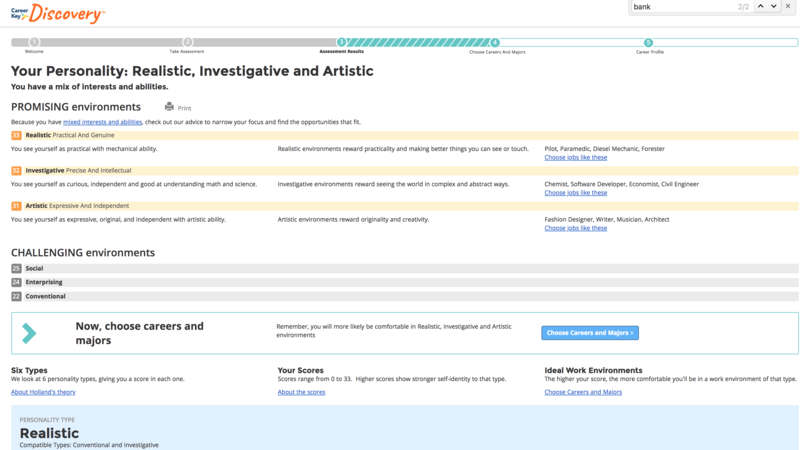 Want a quick overview of how CKD displays assessment results to discoverers? Go to the Discovery Process Step-By-Step > Take Assessment. Now we’ll go into more detail about what Assessment Results mean and best practices for advising discoverers about their results. 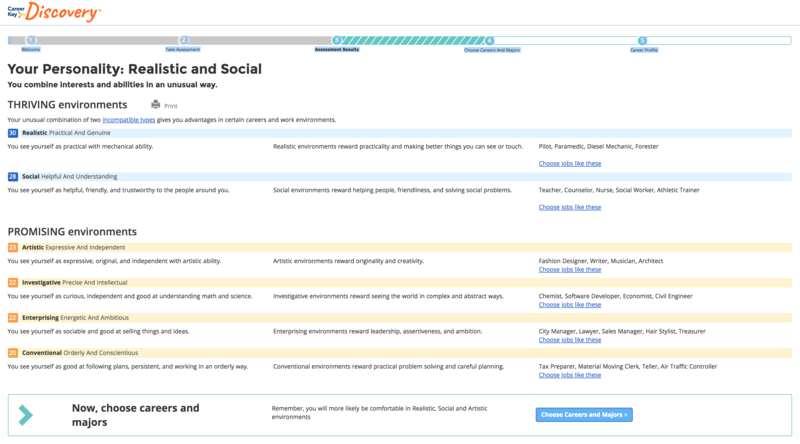 While you don’t need to be a professional counselor to help discoverers interpret their scores, you should become familiar with some best practices and the most common personality patterns. You’ll feel more comfortable giving advice that helps discoverers succeed – the main reason you’re using Career Key Discovery (CKD)! We know it’s important that discoverers get advice that is relevant and meaningful to them. For that reason, we tailor the Assessment Results in CKD to four common personality patterns (see next section). Using our recommended best practices, guides can expand the impact and understanding of results through direct follow up, especially using CK Central’s Let’s Connect email message templates and one-on-one conversations with discoverers. Encourage discoverers to explore options for their top two personality types. This advice is good for everyone, regardless of their scores. Some careers and programs of study are an even or nearly even split between personality types. By only looking at one type, a discoverer could miss an option that may be a great fit. Keep in mind that there is no meaningful (statistical) difference between scores of 5 points or less. So the closer they are together, the more important it is for broader exploration of types. See About the Scores. Identify obstacles discoverers have to decision making, and help them overcome them. Some may be small and easy to fix like a lack of information, while others may be more complex. See Decision Making advice below. a. For each career, provide a list of people working in that career who are willing to serve as a resource through informational interviews: teachers, community contacts, school alumni, or parents of alumni. b. For each program of study, provide a list of students studying that program, program graduates, or professors teaching in that program who are willing to serve as a resource through informational interviews. c. Ask discoverers to complete a Decision Balance Sheet (See Discovery Step-by-Step > Plan and Prepare) for their top two or three options and discuss their responses. Like any scientific theory and assessment, Holland’s Theory and CKD have limitations. Holland’s six personality types are constructs or concepts. They are guidelines, not boxes in which people must fit. People vary in how closely they match these personality types; and their scores are not positive or negative indicators. So if a discoverer asks questions about their results, use the opportunity to start an in-depth conversation about who they are. Ask what scores or elements of a personality type feel like a fit or not for the discoverer. This inquiry reveals insights about the person, clarifying their personality match. Career Key sees the assessment results as the beginning, not end of the discovery process. Assessing Holland’s personality types and the discovery process in CKD is just one way for discoverers to learn about themselves and the most compatible environments that research shows are more likely to lead to their success. A close match is important: Choose a career or program that matches one of your top two personality types. Due to the strength of your personality scores, you’re likely to be unhappy and unsuccessful in an environment that doesn’t match. Go one step further: Even if you’re very strong in one type, it’s important to explore your second highest type too. Sometimes there are career or programs that match at almost equal levels of strength both your top type and your second highest type. Challenge your assumptions: If you came into CKD with a firm idea of what you wanted to do, take a moment to consider other matching options you might not have thought about before. Explore all of CKD’s groups for that personality type. Now is the time to gather more information, independent of friends and parents. Decision making process: Download and complete a Decision Balance Sheet. Informational interviews: Talk to people working in that career or studying in that program to gather more information before making a decision. Higher education institutions: Provide information about the discoverers’ top program choices that includes contact information for students, faculty and administrators who can answer questions. 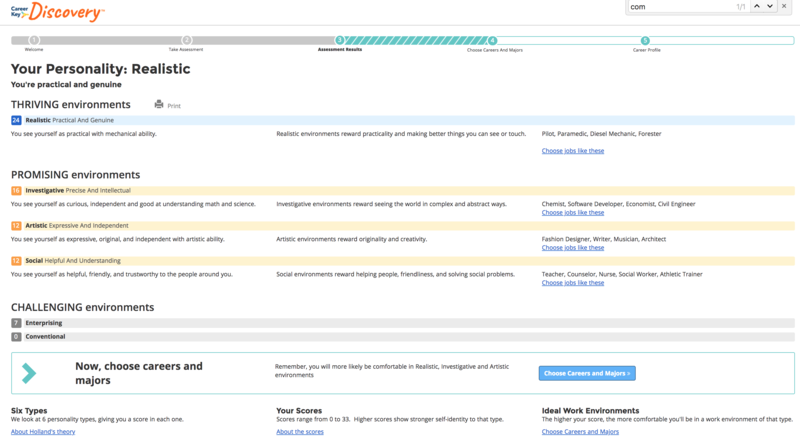 Verify your scores: In Assessment Results, read the definition of each of your strongest personality types in the blue shaded box toward the bottom of the page. Rate each statement on a scale of 1 to 5, with one being “Not Like Me” and five being “Like Me.” This will help you gain insights into personality characteristics that really resonate with you and those that don’t. Feel free to view your results differently after you gain these insights. Try something new and learn more about yourself: Doing activities that involve different types of work, paid or volunteer, will help you identify more of what you like or dislike about people and the environments in which they gather (career or program). Consultation with a career counselor or academic advisor: Professionals can help you explore your CKD results further and introduce you to more activities and resources to help clarify your choices. You combine interests and abilities in an unusual way. Your unusual combination of two incompatible types gives you advantages in certain work and program environments. May have grown up in a household with parents/guardians with opposite personality types. For example, one partner rewards practicality and hands on skills (Realistic), the other rewarded helping people and interests in solving social problems (Social). You are not abnormal or an “inconsistent” person: We all have differing gifts; value your uniqueness. Turn this pattern into an advantage: Some careers and programs combine personality types in this unusual way. For example, a Realistic career with a Social employer, like teaching carpentry in a vocational secondary school. Or an Assistive/Rehabilitation Engineering (Realistic) program of study used to help design mobility devices for the disabled (Social). Create a career or program environment that fits you – your own niche. Within an industry, you can find places where your unusual combinations make you stand out for a career. You may be able to design an education program and choose classes to support your interests. If you are Realistic-Social/Social-Realistic, or Investigative-Enterprising/Enterprising-Investigative, there are many examples of careers and programs that fit these combinations. Visit Career Key’s article on Inconsistent Personality Types for more. Career Key’s YouTube video, “Inconsistent Personality Patterns,” and web article. Offer to help the discoverer apply the ACIP Decision Making Process to their top choices. We summarize this process in the last two steps of Discovery Process Step-by-Step, starting with Research and Make a Decision. Try discussing with them a Decision Balance Sheet they’ve completed. Identify any obstacles and help the discoverer make plans to overcome them. A common source of indecision is a lack of information. Others may include: finances, childcare and family obligations, and disability. Ensure discoverers can easily access information about their top choices, including possible contacts for informational interviewing. If you are in college admissions or student success, that means strategies like connecting potential students with faculty and current students in a program they’re considering. Indecision is not unusual, especially for in the teen years and 20’s, when a person’s personality and abilities are developing. Discoverers’ values, abilities, skills and talents are emerging. And sometimes a person doesn’t know themselves well enough; adult considering a career change may have not have taken the time recently to self-reflect and consider where they are in their lives. Discoverers with Three or More Top Types are more likely to be undecided, so make sure to offer the advice mentioned earlier in this section. It may take more time for these discoverers to clarify their focus, but their efforts will be worth it.